So what if Valentine’s Day was a week ago? 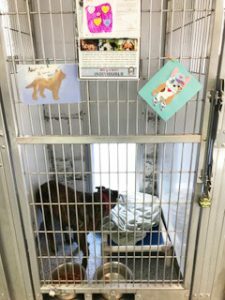 It didn’t stop Justin Rudd and the Haute Dogs team from holding a postponed celebration at Long Beach Animal Care Services (ACS). 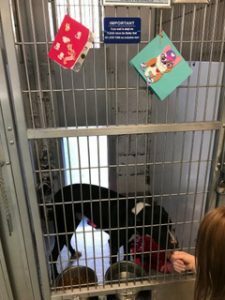 The culmination of the Valentine’s Day Card Contest and Yappy Hour was originally scheduled for Saturday, February 10 but had to give way to the Subaru Loves Pets Valentine Adoption at P. D. Pitchford Companion Animals Village. 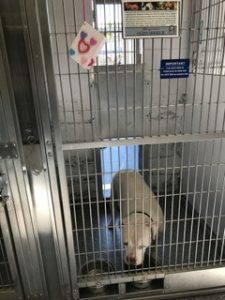 This was just fine, since 10 pets went home from the shelter side alone (Pitchford, like Rome, is divided into two empires—ACS, the city intake side; and spcaLA, a private organization. 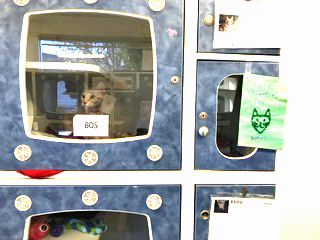 Adoptive animals are available in both sides). Rudd’s Valentine’s event, like most of his myriad other projects, are multifaceted in intent. Key words here are healthy competition, kindness to animals, socializing pets, adoption and more eyes on cats, dogs and rabbits. 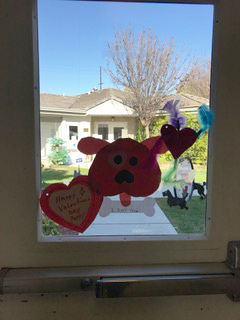 The young “competitors,” mostly schoolchildren, made Valentines for the pets, and volunteers attached them to the kennels. The cards will stay in place for a few days. Meanwhile, all the funny Valentines in these photos are waiting for their forever loving homes. 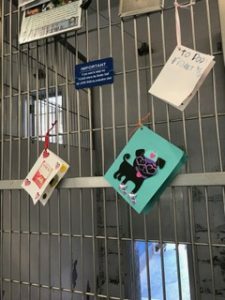 Handmade cards, earnestly expressing love for pets as only children can express it, adorned the pets’ kennels. 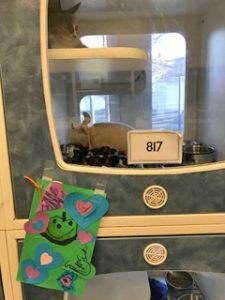 A pizza party was awarded to the class of the student who submitted the winning card, but even that seemed like a secondary benefit next to the attention the pets got. 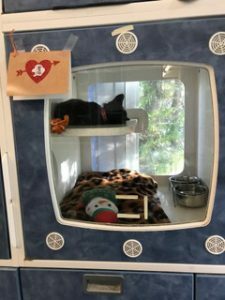 The pets seem to love that attention, particularly the dogs, and visitors to the shelter got to see potential housemates in an atmosphere of sweetness. There were cookies, too (thanks, Erin and Colin!). 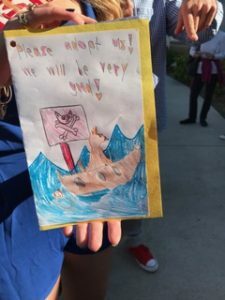 Second-grader Eva won the pizza party for her pirate-themed valentine card. Eva had to be called away more than once from the dog kennels to be honored for her effort! 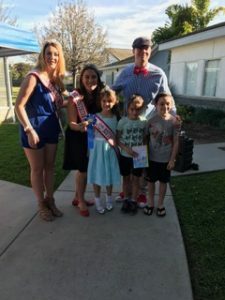 A jauntily outfitted Rudd poses with Eva and her twin brother along with the Long Beach Pageant members. 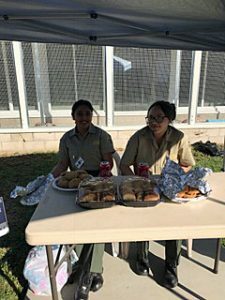 The shelter’s Explorer Academy members Kiana Claro and Monse Rogers presided over the event and offered those cookies. With all the bitterness, divisiveness and horrid events that are happening in so many places, it seemed a good idea to introduce some sweetness. Apologies in advance—I’m no photographer—but an in-person, up-close visit would give you a better idea of the cards and the critters. Pretty obvious ploy for adoption, of course, and for that, I don’t apologize. Happy Valentine’s Day, forever, to our homeless pets. 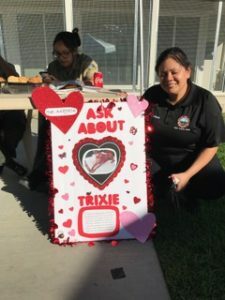 Animal Control Officer Edna Sorenson, leader of the Explorer youth, has a special project whose name is Trixie. Trixie (ID#A489806) is 13 and has had a lot of medical issues, which have been taken care of. Read more about her here (and see a better photo), and if you or anyone you know might be interested, call the rehoming team at (562) 7387. Despite his name and apparent demeanor, we’ve all seen Droopy (ID#A504961) burst into life in the new Dog Play Yard at the shelter (more about this in a future article). Norman (ID# A583593), handsome Great Dane mix. Quigley (ID# A602989) is a pit bull mixed with something that made those starchy ears! 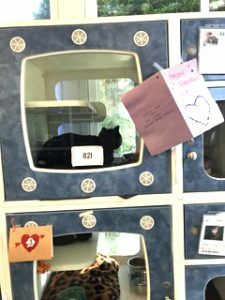 Most of the cats were curled up in the kennels. 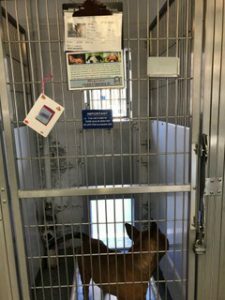 Some hadn’t been given a name as of this date—many get picked up as strays, and there’s a mandatory waiting period to see if a cat’s or a dog’s owner shows up. They need valentines, too. Asher, (ID# A579781) was wide awake and waiting. 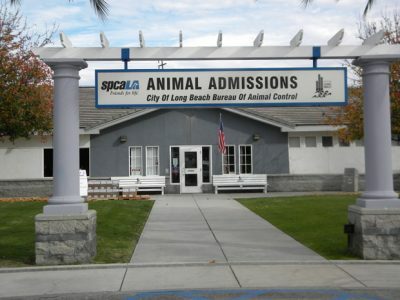 Long Beach Animal Care Services is located in the P. D. Pitchford Companion Animal Village, 7700 East Spring Street, Long Beach, at the entrance to El Dorado Park (no parking fee for shelter visitors). Use the entrance shown in the photo.